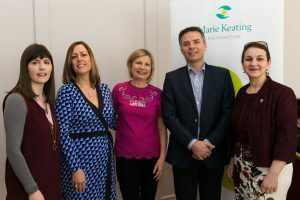 On 21st April 2018, the Marie Keating Foundation hosted a unique event for carriers of hereditary cancers, family & friends of women at high risk of breast and ovarian cancer. Supported by AstraZeneca, this unique event, saw over 130 in attendance at the Clayton Hotel Leopardstown last Saturday. Hereditary cancer syndromes are genetic disorders which are transmissible from parents to their children. The carriers of these mutations have a significantly higher risk of developing several types of cancer, some of them listed in the top five of the most common and / or most deadly cancers including breast, ovarian, prostate, colorectal, uterus, stomach, melanoma, pancreatic cancer, etc. Colleagues, clinicians and researchers came together to discuss and lend their practical insights to increase the understanding of the issue in Ireland and to help attendees to learn about new developments in BRCA1 & BRCA 2 research and clinical care options. BRCA carrier Anne Kane said that this unique event gave BRCA carriers a platform to meet and discuss with each other and medical professionals about what they are going through and what options they have. “It was a super day and very informative. I believe that as someone who has had all the surgery and taken preventative measures the whole process for me was scary and lonely and while I knew I was not alone I just wanted to chat and ask questions to women who had been through it. The Marie Keating Foundation has now opened out this platform to BRCA carriers and their families”, Anne Kane, seminar attendee. 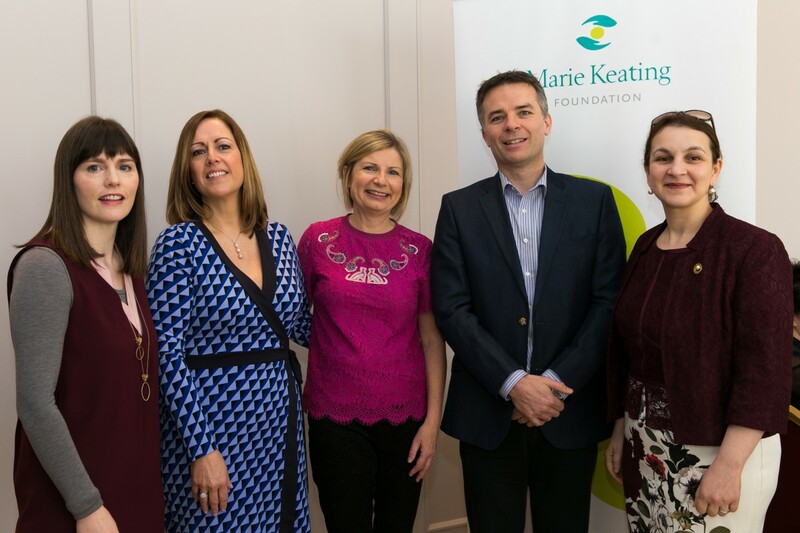 The Marie Keating Foundation event brought together experts in genetic medicine, gynaecology, plastic surgery and psychology all of whom are united in one goal: bettering the lives of those living with hereditary cancers, in particular the BRCA genes and their families and friends. Dr Reem Salman, Breast Surgeon explains ‘BRCA1 and BRCA2 are human genes that produce tumour suppressor proteins. These proteins repair damaged DNA, and therefore play a role in ensuring the stability of the cell’s genetic material. When either of these genes is mutated, the cells are most likely to develop additional genetic alterations that can lead to cancer. The evidence is that for women carrying the gene, there is about a 65-87 % lifetime risk with BRCA1 Mutation and about 45-84% lifetime risk with BRCA2 mutation for a woman to develop breast cancer by the age of 80. “The known inherited susceptibility genes, BRCA 1 and BRCA 2, give rise to increased lifetime risks of developing the disease, often at an earlier age. Thus genetic counselling aims to identify individuals with significantly increased genetic risk of cancer at an early stage and counsel them on appropriate risk reducing behaviours and actions and ensure appropriate surveillance to reduce disease morbidity and mortality”, she continues. “As there are no standard referral guidelines for family history clinics, the symptomatic service with fixed budget and limited health care resources is currently facing a huge demand for family history counselling and genetic risk assessment”. Speaking at the event, Roisin Prizeman who is a carrier of BRCA1 said that “BRCA families are faced with challenging and complex situations and we need expert and up-to-date information such as we’ve received here today. We also need a good support network and today has afforded the opportunity for attendees to connect and share experiences. This is a vital component in helping BRCA families to negotiate what can be a very difficult journey at times. I would like to thank the Marie Keating Foundation for organising this event today and for their ongoing support for BRCA and high risk families in Ireland”. This one day private seminar provided up to date clinical research information focusing on BRCA in Ireland, risk factors, breast reconstruction options, long term impact of BRCA status and more. The seminar concluded with a panel discussion and attendees had the unique opportunity to address their questions to BRCA experts working in both clinical and research fields. More on BRCA can be found on here. “Empowering. That’s the best word I can use to describe my experience at the first ever Marie Keating Foundation Seminar for carries of a BRCA mutation on Saturday. The wonderful Roisin Prizeman, who was my confident in the early days, has poured her heart into ensuring this day came to fruition and what a day it was thanks to the help of Carla O’Neill in MKF. To be in a position to spill my guts and share my story in such a safe space was therapy in itself for me. To finally be in the presence of so many women who “get it” was so helpful, calming and reassuring for me. I’ve often tried to describe the limbo that many BRCA carriers find themselves in, not a patient and not sick, it can be a lonely place to find yourself. But to say those words out loud on Saturday and to see so many reassuring nods from the crowd gave validation to my anger and my frustrations, “, Aisling Drummond, Speaker and seminar attendee. You can read Aisling’s overview of the seminar on her blog here. This entry was posted in Latest News and tagged April, BRCA, Seminar. Bookmark the permalink.